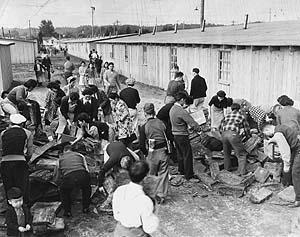 Camp Harmony, at the Puyallup fairgrounds, was a temporary detention center for Japanese "evacuees" on their way to camps farther inland. Here, in 1942, internees pick up firewood to heat their barracks-style living quarters.Photo Credit: Seattle Times. MASA HAITO'S SHARP EYES AND STEADY NERVES helped him defeat 129 other pitchers in the Seattle Times-Park Board baseball contest. His 12 strikeouts in the competition at Collins Playground earned him the right to compete for the district championship in late May 1942. But Masa Haito did not pitch in the finals. And five of the top 10 honor students in the senior class at Broadway High School did not attend their graduation ceremony. They all had been "evacuated" with their families to camps in the interior -- a security precaution as the United States went to war with Japan. The Japanese bombing of Pearl Harbor in December 1941 drastically altered opportunities for thousands of Japanese Americans along the Pacific coast. Overnight, many who had called Puget Sound home for nearly half a century became "enemy aliens" with their life work in jeopardy. 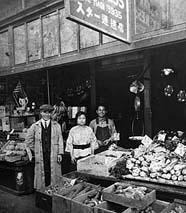 In Seattle many Japanese Americans had built successful businesses like the Tanagi Grocery Store. Photo Credit: Sharon Aburano Coll., Wing Luke Asian Museum. SIGNIFICANT NUMBERS OF JAPANESE IMMIGRANTS had first arrived in the region in the 1880s. Exclusion acts aimed at the Chinese had opened up jobs in the Northwest for Japanese laborers willing to endure the backbreaking toil required on railroad-construction crews or in area sawmills, coal mines and salmon canneries. Hoping to make fortunes quickly and then return to their homeland, Japanese workers soon found that low pay and discrimination subverted their dreams. Yet many eventually built a successful stake in the Northwest. Japanese farmers turned hundreds of acres of stumpland in Bellevue and the White River Valley into farmland yielding berries and vegetables in abundance. Some sold their harvest at the Pike Place Market; by the 1930s, an estimated 75 percent of all produce grown in the region came from Japanese farms. 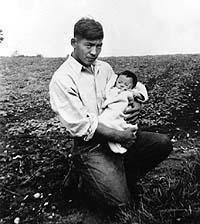 Others, such as Mutsuo Hashi-guchi, holding his son Lester, right, supported their families by farming. Photo Credit: Hashiguchi Coll., Bellevue Historical Society. JAPANESE AMERICANS ALSO OWNED SERVICE BUSINESSES AS DIVERSE AS HOTELS, laundries, banks, groceries, bathhouses and restaurants. In Seattle, a vibrant Japanese district emerged, initially centering in Pioneer Square but soon moving eastward along Yesler and Jackson streets, forming Nihonmachi -- Japantown. Immigration laws denied most first-generation Japanese naturalization rights, but their children, born in the United States, were full citizens. Within the Japanese community, institutions such as the Nippon Kan Theater and the Japanese Language School encouraged members of the second generation -- the Nisei -- to respect traditional cultural values. Yet the desire to become "true Americans" remained, despite the racism of fellow citizens. Wary of successful Japanese entrepreneurs, Seattle businessmen had formed an Anti-Japanese League in 1919; two years later, the state Legislature passed an Alien Land Law, prohibiting the sale or rental of property to anyone ineligible for citizenship. 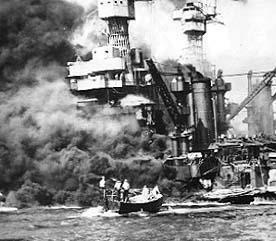 On Dec. 7, the Japanese attack Pearl Harbor, drawing the United States into World War II. The Japanese bombs that sunk the West Virginia and pushed America into World War II also radically changed the lives of Japanese Americans living in the Puget Sound region. Photo Credit: Seattle Times. AFTER PEARL HARBOR, THE REGION'S JAPANESE RESIDENTS BECAME TARGETS of even stronger suspicion and abuse. In Kent, which had the area's largest Japanese-American population, the mayor activated home-defense units to combat sabotage. Several hundred "aliens" from throughout the area were rounded up, while a curfew was imposed on Japanese in Seattle. Many of the city's other Asian residents sported buttons such as "Chinese" or "Not from Nippon." Others responded with sympathy for loyal Japanese citizens caught in the web of war. The Medina School principal used his own car to pick up Japanese-American children denied rides on public buses, and the Council of Churches made a plea for citizens to refrain from "prejudice and bitterness" against their Japanese neighbors. The Times, which had earlier editorialized about the "Little Madmen of the East," now urged readers to avoid hysteria. Prominent Japanese citizens publicly expressed their dismay at the actions of the Japanese government, and more than 1,300 crowded into the Buddhist Temple to pledge allegiance to the United States. Japanese men, some in their 60s, registered for military service. Despite such demonstrations of loyalty, most local residents failed to protest plans to evacuate the Japanese as authorized by Executive Order 9066, signed by President Franklin Roosevelt in February 1942. The Times spoke for many in trusting the military and the FBI to decide whether it was necessary to resettle these "enemy aliens," never mentioning the Nisei's rights as citizens. Map at left shows area of evacuation and location of camps where Japanese Americans were interned. GOVERNMENT RESPONSE WAS QUICK: 300 Japanese Americans were removed from Bainbridge Island by the end of March 1942; 2,000 more from the Seattle area followed in April. Most initially were sent to Camp Harmony, a temporary detention center at the Puyallup fairgrounds. Here the poor food and lack of privacy gave Japanese Americans the first bitter taste of what life would be like as internees. Newspapers depicted the Japanese undergoing evacuation with good-natured acceptance. "It's for the good of the country, so we'll move," one Bainbridge Island farmer was quoted as saying. But classified advertisements told a different story of lands, homes and businesses given up for fire-sale prices. Store owners quietly complained of competitors trying to buy their stock at 5 cents on the dollar. In Washington state, nearly 13,000 people of Japanese descent ultimately were sent to detention centers -- most Seattleites ended up at Camp Minidoka near Hunt, Idaho, while the majority of rural Western Washington evacuees went to Tule Lake in California. There, life went on. The internees' situation was not unlike that of several hundred Italian and German prisoners of war who were confined at Fort Lewis and Fort Lawton. But not one of the Japanese detained was ever charged with espionage or any other crime. Years later, the American government acknowledged that even war could not justify the treatment of West Coast Japanese Americans. Apologies were made, pardons granted and monetary redress paid. But nothing could make up for all the lost opportunities -- the special childhood memories of winning a pitching contest or graduating with honors that could never be regained. Historians Sharon Boswell and Lorraine McConaghy teach at local universities and do research, writing and oral history. Original newspaper graphics courtesy of the Seattle Public Library.